01/24/2009: "Limited Edition Herringbone Knickers"
Sometimes you want to dress up just a little bit more, so we've made another Luxury Limited Edition of our Classic Wool Knickers, this time in imported 100% wool herringbone. The result is comfortable elegance in a sturdy, understated garment, with a rich black satin gusset and an elastic insert in the rear of the waistband to keep you comfortable on bike or off. 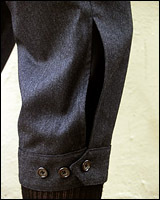 Understated elegance is the theme with these classic yet bike-friendly breeks. They're $175.00, and they're online now, so click on over and see our LLE v2.0 wool herringbone knickers now! Very dressy, very nice (but note, they still have the elastic insert in the back of the waistband, so they're still comfy on the bike! ).